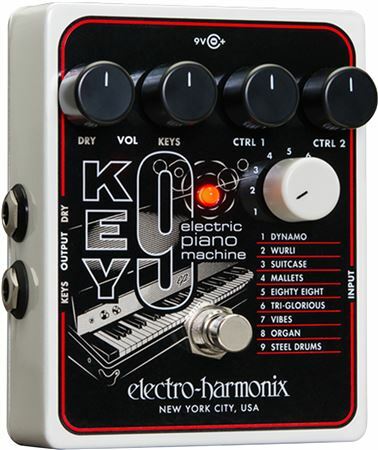 Shop Electro-Harmonix KEY9 Electric Piano Machine from AMS with 0% Interest Payment Plans and Free Shipping. Each preset lets you control the fundamental parameters that help define that instrument’s sound. Many include adjustable modulation like tremolo, phaser and chorus. It’s really making a difference in my presentation, people can’t help but turn and look at me play when I use this pedal!! Like the way Key9 embellishes the B9. Adds deep bass to both B9 or guitar alone. For solo artists like myself, this adds the trio to my guitar and SR18. I'm not a backing track guy. All on the fly so to speak. I can cut songs short or long. Change keys. I wish Alesis had it in the drum box!